Android gadgets, such as Samsung Galaxy Tab 4/3/2, Google Nexus 7/10, Amazon Kindle Fire HDX, Galaxy S5/S4, Asus Transformer Pad TF701T, etc. are all perfect for watching videos on the go. To have more fun, you may want to get movies off of your Blu-ray discs and onto your Android tablet or smartphone for enjoyment. However, Android devices don't have the BD drive for playing Blu-ray movies. That means, if you want to watch Blu-ray movies on your Android, you will need to rip Blu-ray to Android compatible video formats like MP4 first. In fact, with the right program, you can get all done easily and quickly. The best program I can recommend for Blu-ray to Android task is EaseFab Disc Ripper. It is best choice for ripping Blu-ray movies to Android phones or tablets compatible video files with fast ripping speed and excellent output video quality. In addition, this Blu-ray ripping tool can also convert Blu-ray to HD videos and various popular video formats like AVI, MP4, WMV, MPEG, MOV, FLV, MKV, 3GP, etc. as well as rip Blu-ray to optimized video for playback on iPad, iPod, iPhone, Zune, Creative Zen, iRiver, Blackberry, Xbox 360 and more. Get the BLu-ray ripper now and freely enjoy your favorite Blu-ray movies on your Android phones and tablets like Samsung Galaxy Tab, Amazon Nexus 7, Kindle Fire, Nook Tablet, HTC Flyer, Acer Iconia Tab, etc. Click the "Load Blu-ray" button on the top left to add the Blu-ray movie file to the ripper. After the BD files are loaded, you can preview them on the right viewing window and take snapshots of your favorite movie scene. DVD, ISO and IFO files are also supported. Select an Android friendly format, e.g. H.264 .mp4 for conversion. 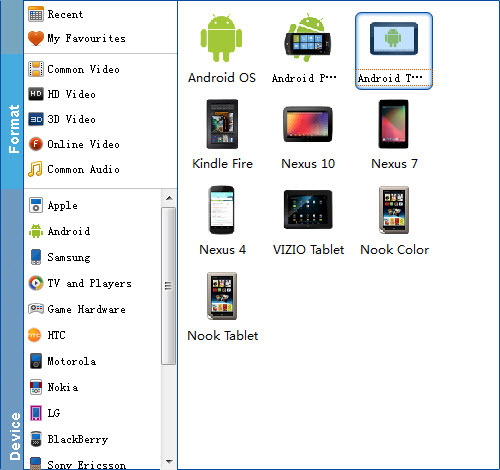 Basically the "Android" > "Android Tablet" or "Android Phone" is a universal format for Android tablets and smartphones. Besides, there are optimized formats for Samsung, Motorola, Acer, Asus, Sony, Toshiba, HTC, etc branded Android devices; choose a proper one as you need. Or depends on your device, you can choose a suitable video format from "Android" catalogue. When all the settings are OK, click "Convert" button to start converting Blu-ray movies for playback on Android devices. When the conversion is over, click "Open" to locate the ripped video files. After that, you can connect your Android phone or tablet to computer via a USB device and transfer the videos to your device for enjoyment on the go. Get the program and start to convert Blu-ray to play on any Android devices!